Positives: Seemed to improve defensively with a year of shortstop under his belt….16 of his 19 home runs came off of right handers….had an .816 OPS away from St. Louis….his best month was in April when he hit .275 with an .866 OPS….went one for two as a pinch-hitter….hit .317 with a .982 OPS in the 17 games he hit sixth….hit .308 on the first pitch….10 of his home runs came after he got down 0-1….had a 1.010 OPS when ahead in the count….five of his home runs came with two outs….hit .288 with six homers with runners in scoring position….hit .283 in high leverage situations….had an over 1.000 OPS in the third, fourth, and eighth innings….had a .958 OPS the second time he saw a starter in a game….hit .419 when he pulled the ball….hit five home runs against the Reds….hit .310 against the Brewers….hit .302 in his last 13 games of the season with two homers. Negatives: Hit just .198 against left-handed pitching….had only four home runs in Busch Stadium….while the rest of the team rocked August, he hit only .202, though he did have six home runs….in six games hitting second, he put up a .465 OPS….had a .559 OPS when the count was even….hit .210 with the bases empty….hit .195 in 200 low-leverage at bats….had a .304 OPS in 55 plate appearances in the first….hit .155 the first time he saw a starter in a game….hit .190 with just two home runs off of power pitchers….hit .220 against the Cubs but drove in 11….hit .115 at Great American Ball Park. 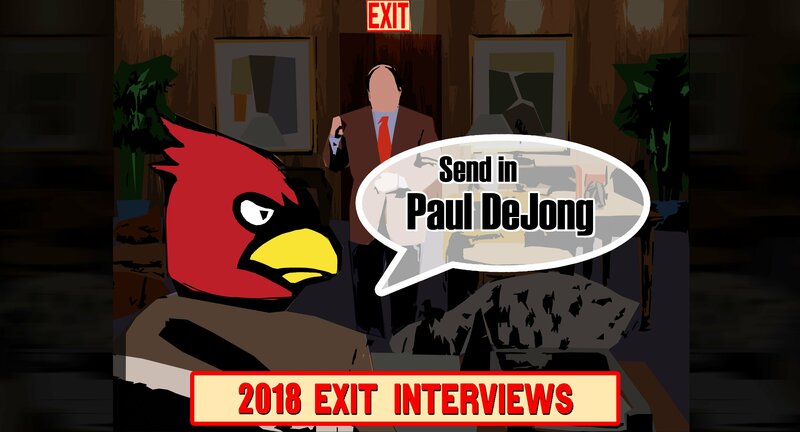 Overview: DeJong solidified himself as a good option in the middle of the diamond. He missed some time with a fractured hand and it took a while for things to get back to normal, hitting .217 with one homer in July before, as noted above, still struggling in August with a bit of his power returning. Overall, though, DeJong’s a guy that’s an asset to the lineup and the fielding and while you can probably upgrade in both areas if you need to, there’s no pressing urge to do so either. It would be nice to see him return to the 2017 levels in average and OPS but all in all, DeJong’s a nice player to have on your team. Outlook: DeJong’s success the last couple of the weeks of the season bodes well for a full recovery from the fractured hand and hopefully a resurgence in his overall game as well. Next season will be his age 25 year which should see him make strides toward his prime. The Cardinals do have the option this winter of acquiring a shortstop and sliding DeJong to third, but it would seem more likely the Cards get a corner infielder and leave DeJong exactly where he is.